The Suarez sisters are perpetually on the move. We catch up with them on a typical weekend at home in New York City and they’ve already updated their blogs, worked out, met up with friends at a party, had a picnic, and explored the city—all before their Sunday coffee-and-bookstore excursion. 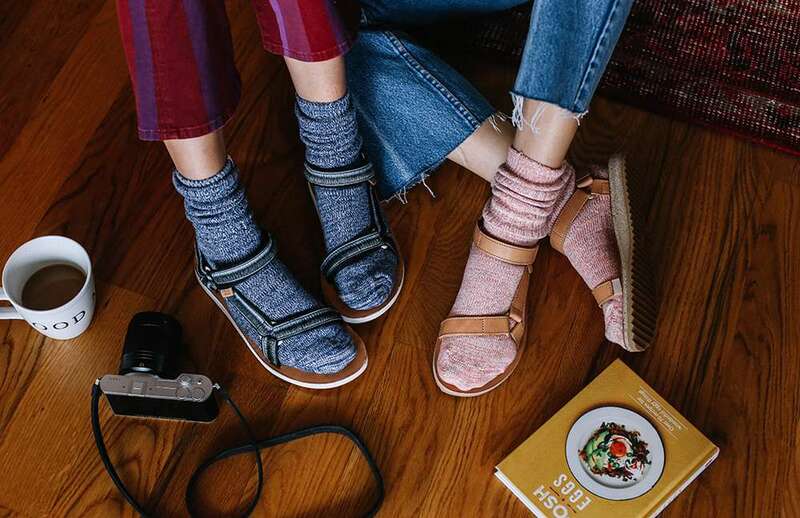 From casual athleisure looks to eclectic party dresses, the duo paired their favorite outfits with our favorite fall trend—socks and sandals—to prove risk-taking style is the perfect fit for every season. Natalie Suarez, model, blogger, singer, and travel-addict. Dylana Suarez, photographer, stylist, writer. Natalie: Definitely a horse. I’ve always been obsessed with horses and my birthdate is also in the Chinese Zodiac’s year of the horse. I love their strength, beauty and freedom. Dylana: A dolphin. I’ve always loved being by the water. There’s something both friendly yet mysterious about the ocean, and the same goes for the dolphin. They act in ways that are unexpected for how they look. Natalie: I feel there’s a place in NYC for everyone because there is so much culture and art. I live in DUMBO, meaning “down under the Manhattan Bridge overpass” and it is, by far, one of the most beautiful parts of Brooklyn. It’s iconic with its views of the Brooklyn and Manhattan bridges, and it’s lined with stunning cobblestone streets. Dylana: The energy is infectious. The amount of adrenaline that rushes through this city is what inspires me to keep going, to keep working, to keep dreaming, to keep surrounding myself with the gems of people that I meet on a daily basis. 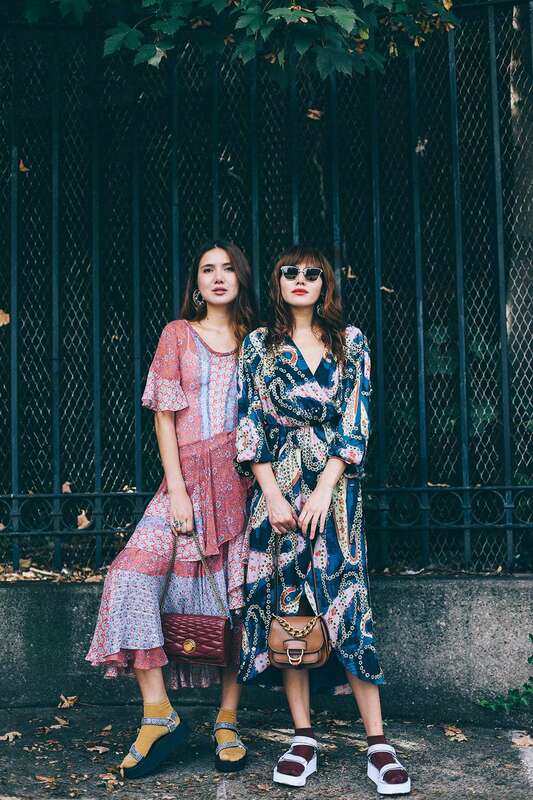 I love vintage and consignment shopping in Brooklyn; that’s where I get all my unique statement pieces: Beacon’s Closet, Gentle Fawn, Stella Dallas, and Urban Jungle are my favorites. 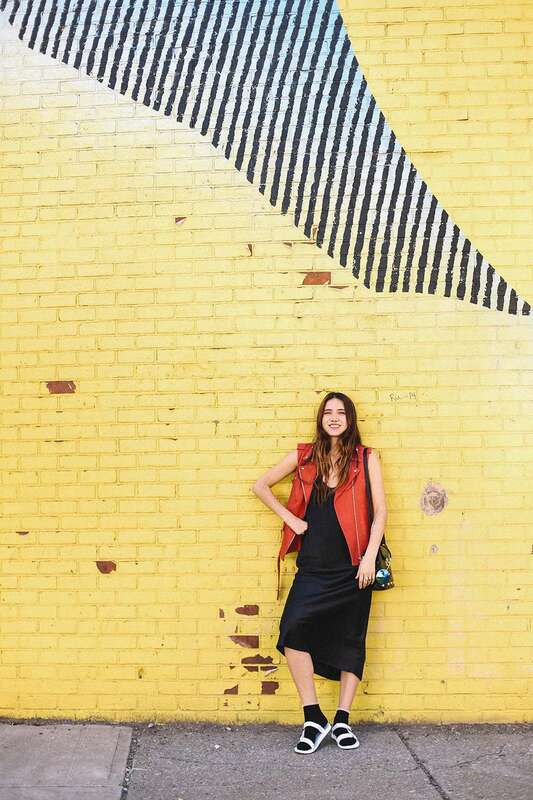 Natalie: Eclectic, colorful and free. Dylana and I have very similar style—we’ll always gravitate toward the same dress or jacket or shoe. We just happen to style it all so differently. Dylana: Bohemian at its core, but mixed in with a city edge and sophistication. Natalie: I’m very inspired by rock icons such as Patti Smith, Mick Jagger, Jimi Hendrix, and Janis Joplin. There’s a part of me that’s also inspired by the minimalism of French fashion, too, like the T-shirt-and-jeans look from Jane Birkin. Dylana: One of my biggest style inspirations is Jimi Hendrix! He has influenced my choice in patterned blouses ever since I aw a video of him performing at Woodstock. Stevie Nicks because of her earthy and airy style. Sisters are known for “borrowing” each other’s clothes. What do you always take? Natalie: Dylana has the best vintage because she spends a lot of time digging. She has this killer vintage Japanese bomber jacket from the Brooklyn Flea Market that is bold purple and silk and it’s stunning. Dylana: I love Natalie’s coat collection: vintage fur coats, patent leather trench coats, knitted designers ones. And her boots! We always share shoes since we have the same shoe size. Is there a right way to wear socks and sandals? Natalie: I love to go light versus dark, pairing my favorite white Teva Flatform sandals with a dark, sparkling maroon sock. Really, anything goes, but I love the contrast so my sandals pop. 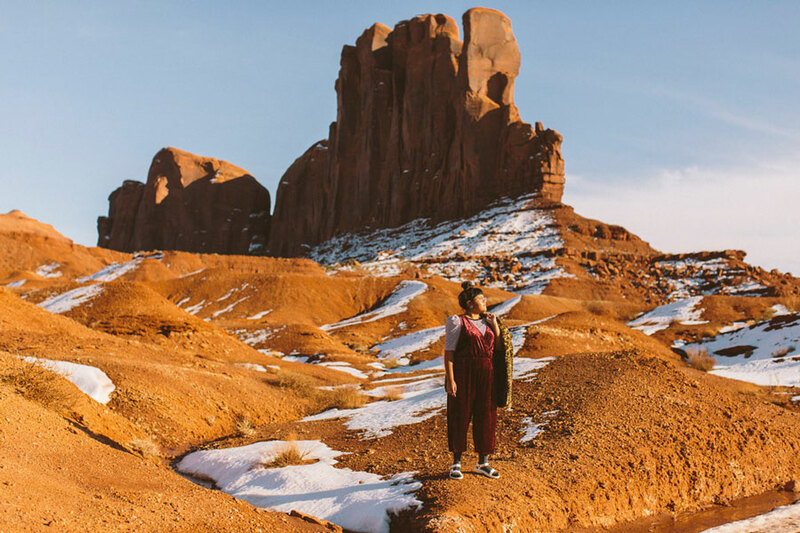 Dylana: I like to pay attention to colors that work well together, like a dress in rose tones paired with mustard yellow socks and a black sandals. If you find a color combination interesting, or focus on a certain color theme from head to toe, the look will work out. 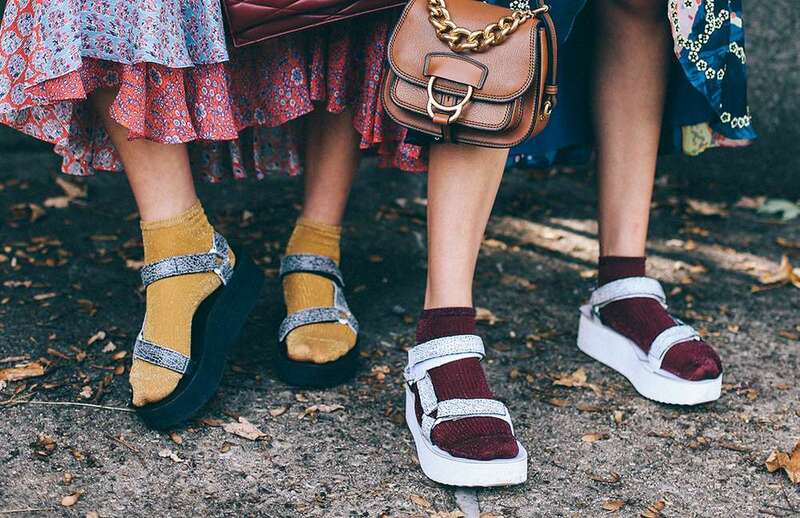 Pairing socks and sandals is a controversial fashion statement—why do you rock the look? Natalie: I love anything unexpected and fun. I wear my Teva sandals so much in the summer when I’m traveling or going to music festivals, so it’s nice you can transition them for fall in such a fashion-forward way. 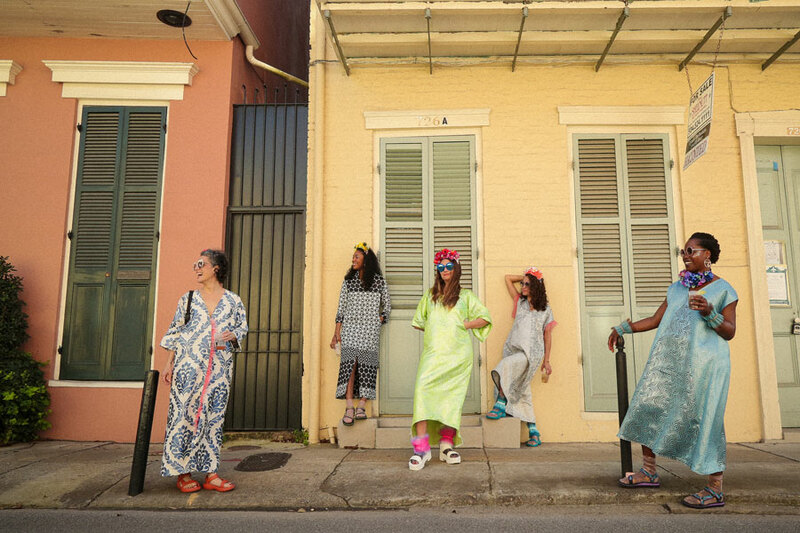 The socks and sandals trend is quirky and cool. With confidence and the right outfit, it totally works. Dylana: It makes a statement and starts a conversation. Not only that, but the look is super cute, not to mention comfortable, and I love that it allows us to get creative with our outfits and see things in a fresh light.